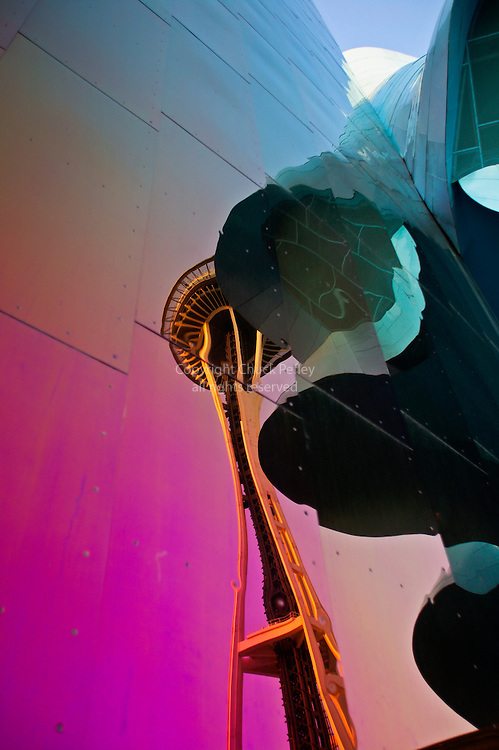 Space Needle reflected in shiny curved skin of EMP Experience Music Project and Science Fiction Museum and Hall of Fame building at Seattle Center Seattle Washington..The EMP Experience Music Project Building was designed by Frank Gehry as a participatory museum of music. EMP is modern in style and constructed with a fabricated steel frame covered with shotcrete and sheet metal panels. The undulating form is meant to be musical and is dedicated to Jimi Hendrix and was commissioned by billionaire Paul Allen.